The tentacles of technology reaching into every available space in our lives have made us all cripples! How so? We read an SMS, hear talk radio, watch the talking heads on the flat screen – each and every one trying to convince us to believe them; we see the headlines of the dailies discarded on the streets, chat over the ‘net, receive so many newsletters we can barely read the first paragraph of most of them, and an info search gives us 400 million responses. It’s not that we have insufficient information available – we are drowning in information! So why don’t we know everything we need to know? Why don’t we know the facts? Why did we go through life thinking Pluto is a planet only to find we’ve been duped since kindergarten? And how dare ‘they’ tell us now that eating too many eggs won’t raise our cholesterol after a whole generation has suffered pangs of guilt with every egg we ate?! The key here is first to want the truth then to seek the facts, to filter the information, find reliable sources. Then we must determine the truth by verifying what we have found with other reliable sources. It’s impossible to reject intentional lies and propaganda if we don’t expose it to the light of truth and logic and test it. The rumors won’t crash mailing lists, waste paper and fill airwaves if the humans don’t pass them on to ’10 friends’. Truth seekers compare reliable sources, check opposing views and continually re-verify as new facts become known. Others will continue to live in ignorance and say they just didn’t know or understand. But at the end of the day each one of us is responsible for the sides we take, issues we support (or not) and ignorance will be no excuse. Whose human rights are abused on massive basis? A timeless Myths and Facts article provides a surprising view of daily life in Israel and shines the light of truth into one of the many dark corners of propaganda: the humiliation of the Checkpoints. Israelis are so accustomed to living in this distorted reality that they mostly ignore it. But when they do notice, when security is tightened, they ask themselves: Who really lives in the Ghetto? Perhaps you in Europe and America might take a new look at YOUR situation: Can you go about as freely as you once did? Can you fly without an intensive search and take whatever you want with you? “They” caused this…but who are “They”? Bob, in Israel, every Israeli is searched numerous times during the course of a single day. 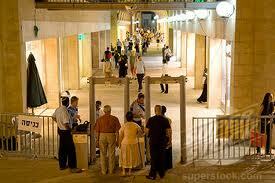 Israelis are asked to open their bags and purses for inspection. In most cases, they are subjected to body searches with a metal detector every time they enter a bank or a post office, pick up a bottle of milk at the supermarket, enter a mall or train station, or visit a hospital or medical clinic. Young Israeli men and women are physically frisked in search of suicide belts before they enter crowded nightclubs. As a matter of routine, Israelis’ car trunks are searched every time they enter a well-trafficked parking lot. Daily, their cars pass through roadblocks that cause massive traffic jams when security forces are in hot pursuit of suicide bombers believed to have entered Israel. Israelis are searched not only when they go out for a cup of coffee or a slice of pizza, but also when they go to the movies or a concert, where the term “dressed to kill” has an entirely different meaning. These ordinary daily humiliations now extend to similar searches when Israelis go to weddings or Bar Mitzvahs. No one abroad talks about the humiliation Jews in Israel are subjected to, having to write at the bottom of wedding invitations and other life cycle events, “The site will be secured [by armed guards]” – to ensure relatives and friends will attend and share their joyous occasion. One out of four Israeli children, ages 11 to 15, fear for their lives. One out of three report they fear for the lives of their family members, and more than a third report they have changed their patterns of travel and social lives due to security concerns. Bob, these ubiquitous security checks do not exist in Arab cities and towns in Israel (or, for that matter, in Judea and Samaria) because those places are not and never have been targets of Palestinian terrorism. In fact, the average Israeli is “humiliated and harassed” by being searched far more times a day than the average Palestinian. Not one human rights group, nor you, has so much as noted this massive intrusion into the rights of privacy and person imposed on Israelis. To date, no one protests the fact that, since the 1970s, Jewish schoolchildren in Israel are surrounded by perimeter fences, with armed guards at the schoolyard gates, as if their schools were the domiciles of Mafiosi. Not one Arab village in Israel or the Territories has a perimeter fence around it. 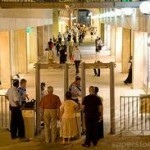 Guards are not required at Arabic shops, cafes, restaurants, movie theaters, wedding halls or schools – either in Israel or in the Territories. 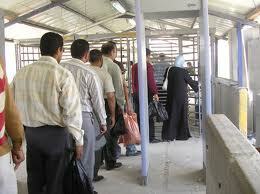 Palestinians also do not need armed guards to accompany every school trip, youth movement hike or campout. They are not targets of terrorism. Countless Israelis in sensitive areas within the Green Line – not only in the Territories, but also in Jewish towns, villages and bedroom suburbs – are “ghettoized” behind high fences. Many Israeli motorists avoid major arteries that pass through Arab areas of Israel, while Arab citizens and Palestinians from the Territories continue to enter Jewish cities and go about their business without peril. Israelis are told, in effect, to disguise themselves when traveling abroad – not to speak Hebrew in public and not to wear garments that reveal their Jewish-Israeli origins. Even Israel’s national airline – El Al – has been forced to remove its logo from the tails of its aircraft at certain airports, out of concern for the safety of its passengers. This followed several attempts to down Israeli civilian aircraft with missiles. On the other hand, Arabs who frequent Jewish cities and towns in Israel wear their traditional Arab headgear without fear of being attacked or harassed. Bob, all this begs the question: Who are the victims and who are the victimizers? Who are the ones being harassed and humiliated? Palestinian Arabs or Israelis? See www.mythsandfacts.org for more information! I am a current visitor to Israel. I love the country and everything I have seen and done has involved a trunk search for my host’s car at parking facilities, and at the individual stores I am asked for my purse; malls are more lenient after the initial entry. I flew El Al to Israel, solely for the safty factor. That being said, after the second or third day I became complacent with the drill. I now wonder how I would feel if I had to go through the same search in the US. Greetings I found your page by mistake when i searched Yahoo for this subject, I have to express your webpage is quite useful I also love the style, its good! Hey, really good post. Made me wonder. How would this apply in my country? The subsequent time I learn a weblog, I hope that it doesnt disappoint me as a lot as this one. I imply, I know it was my choice to read, but I truly thought youd have something fascinating to say. All I hear is a bunch of whining about something that you might fix should you werent too busy on the lookout for attention. I will right away grab your rss feed as I can not in finding your e-mail subscription hyperlink or newsletter service. Do you have any? Kindly let me recognise so that I may subscribe. Thanks. I love your writing style really enjoying this internet site. “We must use time as a tool, not as a couch.” by John Fitzgerald Kennedy. Very good info can be found on weblog . “The fundamental defect of fathers is that they want their children to be a credit to them.” by Bertrand Russell. I liked up to you will receive carried out proper here. The cartoon is attractive, your authored material stylish. nonetheless, you command get got an shakiness over that you wish be handing over the following. sick for sure come further until now again since precisely the similar nearly a lot steadily within case you shield this increase. Definitely consider that which you stated. Your favorite justification seemed to be at the net the simplest factor to understand of. I say to you, I definitely get annoyed whilst folks think about concerns that they just don’t understand about. You managed to hit the nail upon the top and also defined out the whole thing without having side effect , people can take a signal. Will likely be again to get more. Thank you! Some genuinely excellent content on this internet site, appreciate it for contribution. “Such evil deeds could religion prompt.” by Lucretius. I like this weblog very much so much great info . “Marriage should be a duet — when one sings, the other claps.” by Joe Murray. I feel that is among the most vital information for me. And i am glad studying your article. However want to statement on few basic issues, The site taste is perfect, the articles is really nice :D. Excellent process, cheers. You are not the common blog author, man. You certainly have something powerful to contribute to the net. Such a outstanding blog. I’ll be back for more. After study a couple of of the weblog posts in your web site now, and I actually like your means of blogging. I bookmarked it to my bookmark web site list and can be checking again soon. Pls check out my web site as well and let me know what you think. I conceive this internet site contains very wonderful indited subject matter articles. Keep up the superb piece of work, I read few blog posts on this internet site and I conceive that your website is real interesting and has got circles of fantastic information. You have observed very interesting points ! ps nice internet site . “Mediocrity knows nothing higher than itself, but talent instantly recognizes genius.” by Conan Doyle. I agree with your Ignorance is No Excuse #1 | israelinsight.com, superb post. Some truly excellent info , Gladiola I noticed this. “Ideas control the world.” by James Abram Garfield. Only a smiling visitant here to share the love (:, btw great design . “Audacity, more audacity and always audacity.” by Georges Jacques Danton. I really enjoy studying on this website, it has superb blog posts. “Beware lest in your anxiety to avoid war you obtain a master.” by Demosthenes. Great post, I conceive people should acquire a lot from this weblog its very user genial. So much fantastic info on here :D.
I agree with your Ignorance is No Excuse #1 | israelinsight.com, fantastic post. A lot of of the things you point out is astonishingly appropriate and that makes me wonder why I had not looked at this in this light before. This particular article really did switch the light on for me as far as this specific subject goes. Nevertheless there is one particular issue I am not too cozy with so whilst I attempt to reconcile that with the actual main theme of the point, let me see what all the rest of the visitors have to say.Well done.